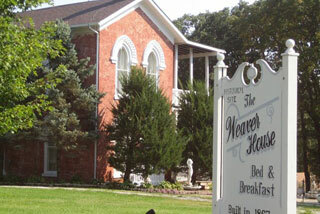 The Weaver House was built in 1867 by General James B. Weaver and is set among beautiful oak trees surrounded by the tranquility of 8 flowering gardens. Experience the atmosphere of our unique National Landmark. This distinctive family mansion beckons you to stop, relax, restore, remember, and rejoice in the historic beauty of The Weaver House Inn. Our inn is located in a beautiful Iowa town, which is surrounded by industrious people who work the land for a living and hold dear their faiths, families, and friendships.